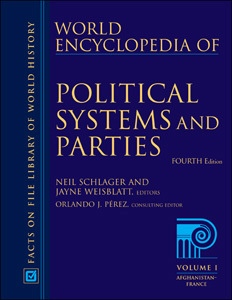 World Encyclopedia of Political Systems and Parties, Fourth Edition provides comprehensive coverage of the governments and political parties of the world's nations. Each country is described in terms of its system and organization of government, as well as the processes through which political parties or interests bring their influence to bear on government. Written by a team of political scientists and academic experts, each signed article includes a comprehensive list of further reading. "The work is a monumental one. Its editor[s] and contributors should be saluted for their fine work." "...recommended for high-school, academic, and public libraries. Even if a library owns previous editions, this update would be a good purchase in order to stay abreast of the many changes in world politics."